ON Wednesday, locals noticed the dead body of leopard lying at ACC Cement factory’s mining site in Panjgain area of Barmana. Dead body of leopard, found in Ladbharol tehsil of Mandi district earlier this year in March. Himtimes|| An another dead body of leopard has been found in Barmana area of Bilaspur district of Himachal Pradesh. Poachers chopped its head, four legs and took them away. Police said the incident came to light on Wednesday when locals noticed the dead body of leopard lying at ACC Cement factory’s mining site in Panjgain area of Barmana. People informed Panjgain panchayat Pradhan Shushil Sharma who informed forest division officer of the matter. Forest department rushed to spot and found that the head and four paws of female leopard were missing from the body of leopard. Police station Barmana was informed thereby which with forest department investigated the spot. After performing a post-mortem it was discovered that the leopard was shot dead by a gunshot. Since the incident was estimated to have been occurred about 20 days ago the body was in rotten state. The age of leopard was estimated around fifteen months. 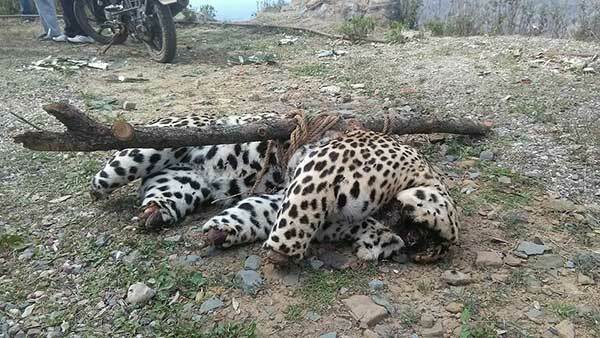 A similar incident was reported in March this year, when poachers killed a leopard and chopped its head, legs and tail in Ladbharol Tehsil of Mandi district.